A new report detailing AMD’s upcoming AM4 platform (which will be used in the companies Zen lineup of CPU’s) has emerged and shows the company will be making some rather big changes to the platform compared to previous designs. AMD will abandon their previously used OPGA socket and instead switch to µOPGA, this revision might seem slight, but it allows AM4 Zen based processors to have up to 1331 Pins, an increase of roughly 40 percent over the 940 of the previous AM boards. OPGA stands for Organic Pin Array (organic in this case isn’t a produce at your local super market, but rather means the plastic which is attached to the silicon die which the pins stick out of). With the switch to µOPGA, the pins will be much smaller (as there are 1331 pins instead of the 940) and thus not only are they ‘thinner’ but also have less space between each pin. AMD have already confirmed that the AM4 platform will be used for a variety of different chips, including both CPUs and APUs. Essentially its to unify their platform for both enthusiast and mainstream and allow folks to easily upgrade their Zen based processors however they’d want. 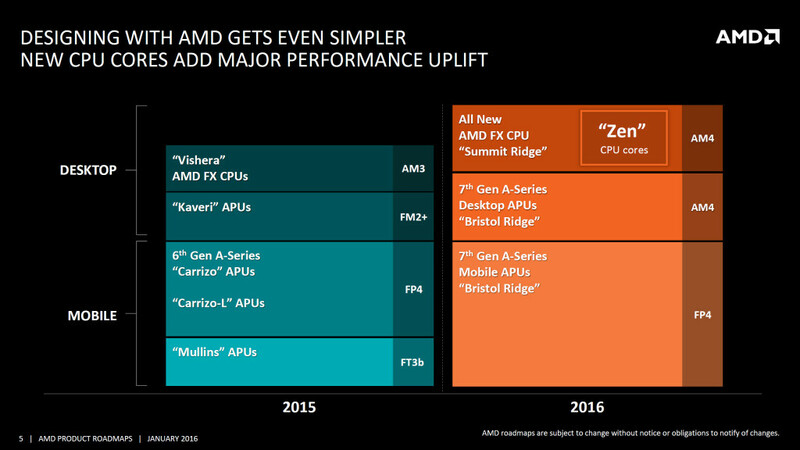 AM4 will support two platforms initially, the first is Zen’s Summit Ridge, which is designed for Desktop’s and features upto 8 Zen cores. The chip will be produced on a 14nm process and is slated to be released in the 4th quarter of this year (2016). As we’ve discussed many times at RGT, the performance will increase about 40 percent over the Excavator core and will naturally embrace the DDR4 memory standard. Bristol Ridge is predicted to appear before Summit Ridge, and will also be AM4 and also FP4. The processor will not be based on Zen, but instead the older Excavator CPU technology and will support both DDR3 and DDR4 memory technologies. As one would expect with an APU, it will come with “Next Gen” GCN GPU cores. In the future we will see Raven Ridge replacing Summit Ridge, which will swap out the older CPU core technology and replace it with Zen. We we recently discussed, supposedly Raven Ridge will be built on a 14nm process and appear on the market in 2017. Supposedly we’ll see this APU with HBM technology (we’re unsure which variant, as it could be HBM1 or HBM2 as the dates are right) and should (according to sources) offer performance compareable to that of the Playstation 4 or Xbox One (possibly higher). Naturally Raven Ridge will also be released on the same AM4 socket. Rumors have it that AM4 motherboards will start appearing on the market within the next few months, but there has yet to be official confirmation of this by AMD as of the time of writing. 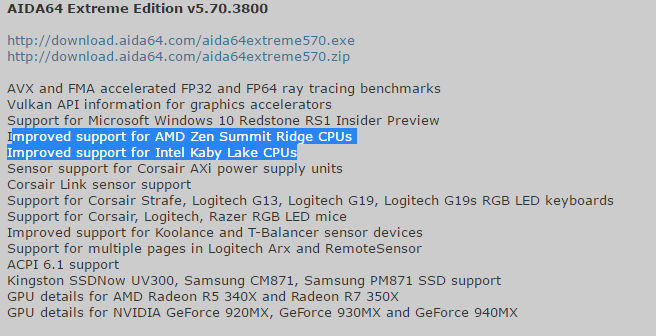 Related to the AM4 details discussed in this article, AIDA64 (a rather popular hardware testing utility) has added further support for both Zen Summit Ridge and Intel’s Kaby Lake range of processors. This means that the early test engineering samples of the CPU’s have left the lab and has been sent out to testers. Tagged with aida64, am4, AMD, amd zen, cpu, Gaming News, kaby lake, processor, rumors, summit ridge, zen.